Mineral processing wastes are referred to in the Resource Conservation and Recovery Act (RCRA) as wastes that are generated during the extraction and beneficiation of ores and minerals. These wastes can be subdivided into a number of categories: waste rock, mill tailings, coal refuse, wash slimes, and spent oil shale. The mining and processing of mineral ores results in the production of large quantities of residual wastes that are for the most part earth- or rock-like in nature. It is estimated that the mining and processing of mineral ores generate approximately 1.6 billion metric tons (1.8 billion tons) of mineral processing waste each year in the United States. (1) Mineral processing wastes account for nearly half of all the solid waste that is generated each year in the United States. Accumulations of mineral wastes from decades of past mining activities probably account for at least 50 billion metric tons (55 billion tons) of material. (2) Although many sources of mining activity are located in remote areas, nearly every state has significant quantities of mineral processing wastes. Mill tailings consist predominantly of extremely fine particles that are rejected from the grinding, screening, or processing of the raw material. They are generally uniform in character and size and usually consist of hard, angular siliceous particles with a high percentage of fines. Typically, mill tailings range from sand to silt-clay in particle size (40 to 90 percent passing a 0.075 mm (No. 200) sieve), depending on the degree of processing needed to recover the ore.
About 450 million metric tons (500 million tons) per year(1) of mill tailings are generated from copper, iron, taconite, lead, and zinc ore concentration processes and uranium refining, as well as other ores, such as barite, feldspar, gold, molybdenum, nickel, and silver. Mill tailings are typically slurried into large impoundments, where they gradually become partially dewatered. Coal refuse is the reject material that is produced during the preparation and washing of coal. Coal naturally occurs interbedded within sedimentary deposits, and the reject material consists of varying amounts of slate, shale, sandstone, siltstone, and clay minerals, which occur within or adjacent to the coal seam, as well as some coal that is not separated during processing. Various mineral processing techniques are used to separate the coal from the unwanted foreign matter. The equipment most frequently used in these plants is designed to separate the coal from reject materials, and incorporates methods that make use of the difference in specific gravity between the coal and host rock. Most of the coal that is cleaned is deep-mined bituminous coal. The reject material is in the form of either coarse refuse or fine refuse. Coarse coal refuse can vary in size from approximately 100 mm (4 in) to 2 mm (No. 10 sieve). The refuse is discharged from preparation plants by conveyor or into trucks, where it is taken and placed into large banks or stockpiles. Fine coal refuse is less than 2 mm (No. 10 sieve) and is usually discarded in slurry form. Approximately 75 percent of coal refuse is coarse and 25 percent is fine. Coarse coal refuse is referred to as colliery spoil in the United Kingdom. Some 109 million metric tons (120 million tons) of coal refuse are generated each year in the United States. There are more than 600 coal preparation plants located in 21 coal-producing states. The largest amounts of coal refuse can be found in Kentucky, West Virginia, Pennsylvania, Illinois, Virginia, Ohio, and Delaware. (1) As the annual production of coal continues to increase, it is expected that the amount of coal refuse generated will also increase. Wash slimes are by-products of phosphate and aluminum production. These wastes are generated from processes in which large volumes of water are used, resulting in slurries having low solids content and fines in suspension. They generally contain significant amounts of water, even after prolonged periods of drying. ( ) In contrast, tailings and fine coal refuse, which are initially disposed of as slurries, ultimately dry out and become solid or semi solid materials. Approximately 90 million metric tons (100 millions tons) of phosphate slimes (wet) and 4.5 million metric tons (5 million tons) of alumina mud (wet) are generated every year in the United States. These reject materials are stored in large holding ponds. Because of the difficulty encountered in drying, there are no practical known uses for wash slimes. The oil shale industry in the United States initially developed in the early 1970's primarily in northwest Colorado with a series of pilot retorting plants that operated for a number of years. Because of unfavorable economics and a lack of sustained government support, the commercial oil shale industry has never developed. Consequently, there is little or no current production of oil shale, and the only spent oil shale available is from the pilot plant operations, which have since been suspended. Many mineral processing waste materials have limited potential for use as aggregates because of their fineness, high impurity content, trace metal leachability, propensity for acid generation, and/or remote location (i.e., away from aggregate markets). However, when the location and material property characteristics are favorable, some sources of waste rock or coarse mill tailings may be suitable for use as granular base/subbase, railroad ballast, Portland cement concrete aggregate, asphalt aggregate, flowable fill aggregate or fill, and engineered fill or embankment. Coarse coal refuse has been successfully used for the construction of highway embankments in both the United States and Great Britain. Coarse coal refuse has also been blended with fly ash and used in a number of stabilized road base installations. Burnt coarse refuse (often referred to as red dog because of its reddish color) has also been used as an unbound aggregate for shoulders and secondary roads. Fine coal refuse (culm or gob) has been recovered for reuse as fuel and is being burned in many cogeneration facilities now operating in the United States. The processing of ores typically involves grinding and the addition of water and chemicals in the ore treatment refining plant, with a large portion of the resulting waste leaving the plant in the form of a slurry. Usually this slurry is impounded to permit settling of the solids, with any free water accumulated in the pond pumped back to the plant or allowed to discharge from the pond to an adjacent water course. Other waste rock (gangue) excavated from the ore body, and any coarse wastes separated during processing are stored in waste piles or in the base of tailings dam embankments. (11,12) By far, the major fraction of mining waste such as waste rock are disposed of in heaps (or piles) at the source. Coarse coal refuse is typically removed from the preparation plant and disposed of in large piles or banks. Such deposits of refuse are sometimes referred to as carbon banks (anthracite) or gob piles (bituminous). Sometimes, refuse in these banks or piles can ignite and burn because of spontaneous combustion. Mineral processing wastes are available from mining and mineral processing operations, most of which are located near the mine source and operated by mining companies. The quality of mineral processing wastes can vary widely and is highly dependent on the specific source. To properly assess these issues, each source of mineral processing waste must be separately investigated. Of particular interest are the environmental properties associated with these waste materials and their potential impacts if used in recycling applications. Depending on the mineral waste processing operations and parent rock involved, acidic leachate from sulfide-based metallic ores, low-level radiation from uranium host rock, or radon gas generation from uranium and phosphate rocks may be environmental concerns. In addition, some waste rock from copper, gold, and uranium mining is leached to recover additional ore. Since cyanide is used for leaching, such waste rock should not be reused without first conducting careful testing. Finally, some iron ore waste rock may contain traces of residual iron, which could cause red staining if exposed for a prolonged period. Such waste rock sources should usually be avoided in applications where aesthetic concerns may be a consideration. Mill tailings from gold mining may typically contain cyanide, whereas tailings from uranium processing may be radioactive and, if so, should not be used in construction applications. Mill tailings from processing of sulfide ores may contain heavy metals such as arsenic. Some sources of taconite tailings have been found to contain asbestos fibers. Mill tailings consisting of quartz, feldspars, carbonates, oxides, ferro-magnesium minerals, magnetite, and pyrite have been used in the manufacture of calcium silicate bricks, and have also been used as a source of pozzolanic material. Coal refuse usually contains some sulfur-bearing minerals, notably pyrite and marcasite, which could result in an acidic leachate. Pyrites can be removed by sink-float techniques during coal processing. Prior to use in embankment construction, coarse coal refuse banks are usually cleaned to remove any residual coal content for use as fuel, especially if the refuse is in an old bank. Waste Rock: Some waste rock has successfully been used as aggregate in construction applications, especially in asphalt paving and in granular base courses. Waste rock has also been used as riprap for banks and channel protection, and as rock fill for embankment construction. Where additional sizing of waste rock is necessary, in order to meet specification requirements, most, if not all, sources can be crushed and/or screened in the same way that a conventional rock source is crushed and screened. Mill Tailings: Coarse tailings, which are generally considered those tailings that are larger than a 2.0 mm (No. 10) sieve, have been used as aggregate in granular base course, asphalt pavements, chip seals, and, in some cases, concrete structures. Fine tailings have been used as fine aggregate in asphalt paving mixes, particularly overlays, and as an embankment fill material. There are numerous examples of the use of mill tailings in local and state highway construction projects throughout the United States. (7) Conventional crushing and screening techniques can be used for sizing mill tailings. Coal Refuse: Coal refuse has been used as embankment fill, with some coarse coal refuse also used in stabilized base applications. Most older coal refuse embankments/stockpiles contain a fairly high percentage of carbonaceous material, which because of poor disposal practices in the past, can ignite spontaneously. As mentioned previously, coal refuse banks are cleaned prior to use in order to remove the carbonaceous material. In addition, modern coal refuse disposal practices mitigate this problem by placing the refuse in thin, well-compacted layers and covering all exposed surfaces with several feet of earth fill in order to reduce or eliminate the presence of oxygen needed to initiate or support combustion. Spent Oil Shale: Spent oil shale has some potential for use as fine aggregate or mineral filler in asphalt paving. Coarse spent oil shale requires crushing and sizing prior to use. The material properties of the various categories of mineral processing wastes are influenced by the characteristics of the parent rock, the mining and processing methods used, and the methods of handling and/or disposing of the mineral by-product. The physical, chemical, and mechanical properties of waste rock, mill tailings, and coarse coal refuse are presented in the following sections. Waste Rock: Waste rock results from blasting or ripping and usually consists of a range of sizes, from large blocks down to cobbles and pebbles. Waste rock can be processed to a desired gradation by crushing and sizing, like any other source of aggregate. The hardness of the waste rock is determined by the rock type. For example, iron ores are often found in hard igneous or metamorphic rock formations, so waste rock from iron or taconite ore processing is usually hard and dense. For the most part, lead and zinc ores are found in limestone and dolomite rock, so the waste rock from processing these ores will have characteristics much like other carbonate aggregates. The specific gravity or unit weight of most sources of waste rock will be in approximately the same range as the specific gravity or unit weight of conventional aggregates. However, the specific gravity or unit weight of waste rock from the mining of iron ore and taconite will be considerably higher than that of conventional aggregates. The specific gravity of waste rock can be expected to range from 2.4 to 3.0 for most rock types and from 3.2 to 3.6 for waste rock from iron ore and taconite minings. Mill Tailings: The grain size distribution of mill tailings can vary considerably, depending on the ore processing methods used, the method of handling, and the location of the sample relative to the discharge point in the tailing pond. In general, the lower the concentration or percentage of ore in the parent rock, the greater the amount of processing needed to recover the ore and the finer the particle size of the resultant tailings. Some ores, such as iron ore, are found in relatively high percentages and are fairly easy to separate. Therefore, the resultant tailings are coarser than those from other ores, such as copper, which is found in very low percentages, and requires very fine grinding for separation. Hence, copper tailings are usually quite fine-grained. Table 1 presents a comparison of the particle size distribution of selected samples of copper, gold, iron, lead-zinc, molybdenum, and taconite tailings. These examples represent a cross-section of the varied size distributions of mill tailings. With the exception of some iron ore tailings, it is probable that most mill tailings will be very fine-grained materials with 50 percent or more of the particles passing a 0.075 mm (No. 200) sieve. Other physical properties of mill tailings include specific gravity, unit weight, and moisture content. There is a scarcity of published information on these properties for most types of mill tailings. The specific gravity of mill tailings, based on limited data, appears to range between 2.60 and 3.35, with most tailings having values under 3.0 except for iron ore and taconite tailings. The dry rodded weight of most mill tailings is likely to range from 1450 to 2200 kg/m33 (90 to 135 lb/ft3). (13) The moisture content of mill tailings is highly variable, depending on the particle sizing of the tailings and the percent solids of the tailing slurry. Mill tailings are almost always nonplastic. 19.1 mm 12.7 mm 9.5 mm 6.4 mm #10 #20 #28 #35 #48 #65 #100 #150 #200 #270 #325 #400 - - - - - - - 99.4 98.0 95.4 92.4 90.2 87.8 N.R. N.R. N.R. - - - - - - - - - 100.0 97.6 94.6 90.3 82.4 72.1 N.R 99.7 83.4 65.1 46.8 17.6 7.9 5.7 4.1 2.8 1.9 1.4 0.9 0.7 - - - - - - - - 99.6 N.R. 91.6 N.R. 69.2 58.2 47.4 41.4 N.R. N.R. N.R. - - - - 100.0 99.5 98.5 95.8 89.5 81.1 70.7 60.3 50.0 44.2 41.5 35.5 - - - 100.0 97.0 92.5 N.R. 86.5 83.0 79.0 74.0 68.0 62.5 53.0 46.0 N.R. N.R. indicates value not reported. Table 2 provides some published physical property data on a copper tailings sample from Arizona. These data are probably representative of the physical characteristics of most fine-grained tailings materials, especially from the processing of metallic ores. * Copper tailings (Duval) from the Sierrita Mine, Duval, Arizona. There are little to no chemical data on waste rock. Data are presented for mill tailings and coarse coal refuse. Mill Tailings: Table 3 provides chemical composition data for selected samples of copper, gold, iron, lead-zinc, molybdenum, and taconite tailings. As seen from these data, most tailings are siliceous materials. Besides iron ore and taconite tailings, gold and lead-zinc tailings samples also contain fairly substantial percentages of iron. Although pH readings are not reported, some sources of mill tailings, especially those with low calcium and magnesium contents, could be acidic. Coal Refuse:Table 4 provides composite chemical composition data for a total of 14 different samples of coarse coal refuse that were analyzed as part of an investigation of the possible use of coal refuse-fly ash blends as base course material. (14) There is no typical chemical composition for coarse coal refuse and the sulfur content of the refuse is related to that of the coal from which it was derived. Like mill tailings, coarse coal refuse is a siliceous material, but it has considerably more alumina than tailings. Coarse coal refuse is almost always acidic. Corrosivity: The pH value of the refuse in water should be determined for proper selection of type of underdrain or other drain pipes. Extremely acidic refuse in the subgrade will require the use of special compositions of coatings on pipes to avoid deterioration or corrosion of the pipe. Deleterious Substances: The oxidation of the pyrite and marcasite in coal refuse is deleterious and produces an acid discharge upon contact with water. Bituminous coal refuse composed of poorly consolidated siltstone can have high tendency toward weathering and can disintegrate under environmental conditions. Sulfate Content: Chemical parameters of coal refuse should be considered when using it for embankment or granular base applications. The determination of the sulfate levels leached from the refuse materials is required to design for the protection of concrete structures. The following tests have been used to determine the sulfate levels: British Standard 1377, Methods of Test for Soils for Civil Engineering Purpose; Test 9 - Determination of the total sulfate content of soil; and Test 10 - Determination of the sulfate content of ground water and of aqueous soil extracts. (17)Typically, the sulfate content of the refuse is in the range of 0.01 to 4.7 percent. The mechanical properties of most interest with respect to waste rock, mill tailings and coarse coal refuse are shear strength, moisture-density characteristics, and permeability. A limited amount of data on these properties are available for waste rock, but the properties would be expected to be similar to those of conventional mineral aggregates of similar rock type and composition. The shear strength of coarse coal refuse is derived primarily from internal friction with comparatively low cohesion. Friction angles have been found to range from 25 to 42 degrees, with anthracite refuse normally having lower friction angles than bituminous refuse. The optimum moisture content may range from 6 to 15 percent, while the maximum dry density can range from 1300 kg/m3 (80 lb/ft3) to 2000 kg/m3 (120 lb/ft3). A wide variety of moisture-density curves have been developed for coarse coal refuse because of the variability of the material, although most moisture-density curves are relatively flat. Permeability values of compacted coarse coal refuse can vary over a fairly wide range from 10-4 to 10-7 cm/sec,(14) depending on the gradation of the refuse before and after compaction. Collins R. J. and S. K. Ciesielski. Recycling and Use of Waste Materials and By-Products in Highway Construction. National Cooperative Highway Research Program Synthesis of Highway Practice 199, Transportation Research Board, Washington, DC, 1994. U.S. Environmental Protection Agency. Report to Congress on Wastes from the Extraction and Beneficiation of Metallic Ores, Phosphate Rock, Asbestos, Overburden from Uranium Mining, and Oil Shale. Report No. EPA/530-SW-85-033, Washington, DC, December, 1985. Dolekzil, M., and J. Reznicek. "Mineral Processing 1989 - Trends and Developments," International Mining, August, 1990. "Gravity Separation," International Mining, September, 1985. Martinez, E. and D.E. Spiller. "Gravity- Magnetic Separation," Engineering and Mining Journal, June, 1991. Murray, Haydn H. Beneficiation of Industrial Minerals Using High Intensity Magnetic Separation, Department of Geology, Indiana University, Bloomington, Indiana. Collins, R. J. and R. H. Miller. "Utilization of Mining and Mineral Processing Wastes in the United States," Minerals and the Environment, Volume 1, No. 1, Surrey, England, April, 1979. Collins, R. J. and R. H. Miller. Availability of Mining Wastes and their Potential for Use as Highway Material, Federal Highway Administration, Report No. FHWA-RD-76-106, Washington, DC, May, 1976. Federal Register Citations, 54 FR 36592, 9/1/89; 54 FR 2322, 1/23/90; 61 FR 2338, 1/25/96; 62 FR 26041, 5/12/97. Evaluation of the Manufacture of Construction Materials from Red Mud and By-Product Sulfates, Final Report to Kaiser Aluminum Company and Allied Corporation, Gramercy, Louisiana, November, 1985. Organization for Economic Co-operation and Development. Use of Waste Materials and Byproducts in Road Construction, OECD, Paris, France, 1977. Collings, R. K. "Current and Potential Uses for Mining and Mineral Processing Wastes in Canada: Standards," ASTM Journal of Testing and Evaluation, Vol. 12, No. 1, 1984. Pettibone, Howard C. and C. Dan Kealy. "Engineering Properties and Utilization Examples of Mine Tailings," Proceedings of the Third Mineral Waste Utilization Symposium, IIT Research Institute, Chicago, Illinois, March, 1972. McQuade, Paul V., W. J. Head, and Robert B. Anderson. Investigation of the Use of Coal Refuse-Fly Ash Compositions as Highway Base Course Material, Federal Highway Administration, Report No. FHWA/RD-80/129, Washington, DC, June, 1981. Sultan, H. A. "Stabilized Copper Mill Tailings for Highway Construction," Transporta-tion Research Record No.734, Transportation Research Board, Washington, DC, 1979. Sultan, H. A. Utilization of Copper Mill Tailings for Highway Construction, Final Technical Report, National Science Foundation, Washington, DC, January, 1978. British Standard Institution. "Methods of Testing Soils for Civil Engineering Purposes," London, B.S. 1377, Test 9, Determination of the total sulphate content of soil, and Test 10, Determination of the sulphate content of ground water and of aqueous soil extracts," 1967. Both waste rock and mill tailings have physical properties that are suitable, in most cases, for use in asphalt paving applications. Coarse coal refuse is generally unsuitable for such use. Waste rocks derived from most ore processing sources can be considered for use in asphalt paving applications provided they satisfy conventional asphalt paving aggregate requirements. Waste rock should not contain deleterious components and must not be commingled with unsuitable materials. Waste rock from iron ore processing is usually either trap rock or granite, which makes an excellent source of aggregate. Table 5. Summary of the use of mining and mineral processing wastes in asphalt paving mixtures in the United States. Colorado and South Dakota have used crushed rock waste from gold mining operations in road construction, including asphalt paving. Lead waste rock has been used in bituminous mixtures in Missouri. Lead-zinc waste rock has been used for resurfacing by local and county agencies in Washington. Trap rock from iron ore processing has been crushed to meet standard specification requirements for hot mix aggregate in New Jersey and Pennsylvania. In Missouri and Illinois, iron waste rock has been used as a skid-resistant aggregate for asphalt paving. In New Mexico, waste rock from molybdenum mining operations has been used as aggregate in asphalt paving with satisfactory performance. (3) Most waste rock is generated in the western United States, particularly in copper mining areas such as Arizona and Utah. Crushing and Screening: Many sources of waste rock are geologically similar to natural sources of construction aggregate, and, therefore, can be crushed and/or screened using conventional aggregate processing equipment. Waste rock from iron ore or taconite processing may be heavier than conventional aggregate. Dewatering: Mill tailings may have to be dried to reduce the moisture content, or may require selective screening and dewatering prior to being introduced into a hot mix asphalt plant. When reclaimed from a tailings pond, stockpiling and air drying for a period of time may be sufficient to reduce the moisture content of some tailings by evaporation, especially in arid areas. Crushing and Screening: Screening and/or crushing may be required in some cases to produce a suitable aggregate like product from mill tailings or to meet gradation specifications. Crushing is not normally required, with the possible exception of some coarse tailings that may require size reduction of oversize particles. Some fine-sized tailings, such as copper mill tailings, can be classified prior to disposal in order to separate the coarser fraction of the tailings for subsequent reuse. Some of the properties of waste rock that are of interest when used in asphalt paving applications include gradation, shape and texture, specific gravity, shear strength, and abrasion resistance. Gradation: Waste rock is often homogeneous but can vary widely in size from boulders down to gravel, due to variations in ore formation and different mining techniques. In general, most sources of waste rock can be reduced to a desired gradation by normal crushing and sizing methods. Shape and Texture: Waste rock is coarse, hard, and angular in shape and can vary in size from large boulders or blocks down to gravel. Shear Strength: Typical values for the angle of internal friction for waste rock materials often exceed 35 degrees and contribute to high bearing capacity and stability. Abrasion Resistance: Most sources of waste rock are able to satisfy abrasion loss requirements. Waste rocks from the processing of iron ore or taconite are usually quite dense and often have relatively low abrasion loss values. Some of the properties of mill tailings that are of interest when mill tailings are used in asphalt paving applications include gradation, shape and texture, specific gravity, absorption, unit weight, and stripping resistance. Shape and Texture: Mill tailings are uniform in particle shape and texture. Mill tailings typically consist of hard, angular, siliceous particles with a high percentage of fines. Specific Gravity: The specific gravity of tailings ranges from about 2.0 to 3.5, depending on the mineralogical composition. Stripping Resistance: Iron ore and taconite tailings do not appear to be susceptible to stripping. Mill tailings from other sources should be evaluated for stripping potential as part of the normal asphalt paving mix design procedures. Waste Rock: Waste rock for use in hot mix asphalt must comply with the requirements for coarse aggregate in bituminous mixtures. (8) Asphalt mixes containing waste rock can be designed using standard laboratory procedures. The potential for stripping of asphalt mixes containing waste rock should be assessed in the laboratory as part of the overall hot mix asphalt mix design. Stripping resistance can be enhanced by adding hydrated lime or a proprietary antistripping additive. Mill Tailings: There are no standard specifications for the use of mill tailings in hot mix asphalt paving. There are, however, a few states that have historically used different types of mill tailings as a fine aggregate, a mineral filler, or in some cases, as a coarse aggregate in asphalt paving mixes. Tailings should meet the appropriate specification requirements for their intended use, either as a source of fine aggregate(9) or mineral filler. (10) Asphalt mixes containing mill tailings can be designed using standard laboratory procedures. The potential for stripping of asphalt mixes containing mill tailings should also be assessed in the laboratory as part of the overall design. 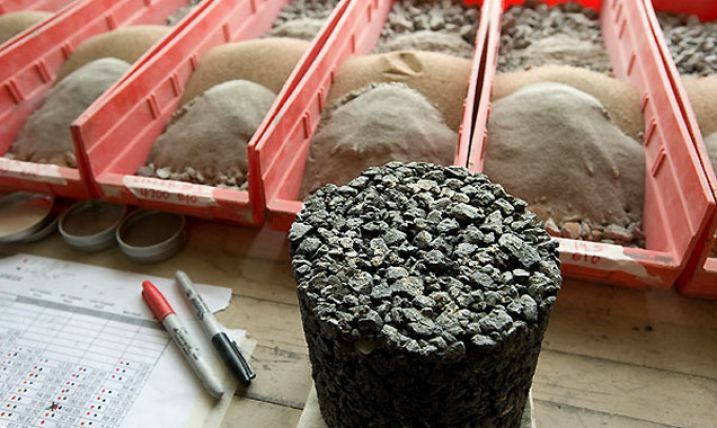 Waste Rock: Conventional AASHTO pavement structural design methods(11) are appropriate for the thickness design of asphalt paving mixtures incorporating waste rock as the coarse aggregate. Mill Tailings: Conventional AASHTO pavement structural design methods(11) are also appropriate for the thickness design of asphalt paving mixtures incorporating mill tailings as the fine aggregate, mineral filler, or coarse aggregate. The same methods and equipment used to store or stockpile conventional aggregates are applicable for waste rock and mill tailings. However, users of those materials should be aware that such materials usually have an acid potential and that leaching may occur during stockpiling or heating in the asphalt plants. The same methods and equipment used for conventional pavements are applicable to asphalt pavements containing waste rock or mill tailings. Compaction operations should be visually inspected on a continuous basis to ensure that the specified degree of compaction can be achieved and there is no movement under the action of compaction equipment. There is a need to establish general environmental criteria for the selection of mining or mineral processing by-products to be used in paving applications. More knowledge is needed concerning the variation in mineral processing operations that can alter the quality of such by-products. More specifically, there is a need to investigate and analyze the environmental impact of some waste rock and mill tailings sources that may contain inorganic metal and sulfide-based metallic ore constituents to assess the level of leachability, if any, when used in hot mix asphalt. Mill tailings may contain concentrations of certain inorganic metal constituents that may be leachable. Some waste rock and tailings have been leached with cyanide as a means of further ore extraction. Certain sources of taconite are known to contain asbestiform fibers. Uranium mill tailings can be a source of residual radiation, and phosphate rock can be a source of low-level radiation resulting from radon gas. Collins, R. J. and R. H. Miller. Availability of Mining Wastes and Their Potential for Use as Highway Material, Volume I, Classification and Technical and Environmental Analysis. Federal Highway Administration, Report No. FHWA-RD-76-106, Washington, DC, May, 1976. Collins, R. J. and S. K. Ciesielski. Recycling and Use of Waste Materials and By-Products in Highway Construction. National Cooperative Highway Research Program Synthesis of Highway Practice 199, Transportation Research Board, Washington, DC, 1994. Collins, R. J. and R. H. Miller. Utilization of Mining and Mineral Processing Wastes in the United States. Minerals and the Environment, Vol. 1, No. 1, Surrey, England, April, 1979. Wright Engineers Limited, Golder, Brawner and Associates Limited, and Ripley, Klohn and Leonoff International Limite., Tentative Design Guide for Mine Waste Embankments In Canada. Technical Bulletin TB 145, Mines Branch Mining Research Centre, Department of Energy, Mines and Resources, Ottawa, Canada, March 1972. Emery, J. J. Use of Mining and Metallurgical Waste in Construction. Minerals and Environment, Paper No. 18, London, England, June, 1974. Rai, M., G. S. Mehrotra, and D. Chandra. Use of Zinc, Iron, and Copper Tailings as a Fine Aggregate in Concrete, International Conference on The Use of Fly Ash, Silica Fume, Slag and Other Mineral By-Products in Concrete, Montebello, Québec, Canada, August, 1983. Hewitt, D. F. Industrial Mineral Resources of the Brampton Area. Ontario Department of Mines, Industrial Mineral Report 23, 1969. ASTM D692-94a. "Standard Specification for Coarse Aggregate for Bituminous Mixtures." Annual Book ASTM of Standards, Volume 04.03, ASTM, West Conshohocken, Pennsylvania, 1996. American Association of State Highway and Transportation Officials. Standard Specification for Materials, Fine Aggregate for Bituminous Paving Mixtures. AASHTO Designation: M29-83, Part I Specifications, 16th Edition, 1993. American Association of State Highway and Transportation Officials. Standard Specification for Materials, Mineral Filler for Bituminous Paving Mixtures. AASHTO Designation: M17-83, Part I Specifications, 16th Edition, 1993. AASHTO Guide for the Design of Pavement Structures. American Association of State Highway and Transportation Officials, Washington, D. C., 1993. American Association of State Highway and Transportation Officials. Standard Method of Test, Sampling Bituminous Paving Mixtures. AASHTO Designation: T168-82, Part II Tests, 14th Edition, 1986. American Society for Testing and Materials. Standard Specification D2726-96, "Bulk Specific Gravity and Density of non-Absorptive Compacted Bituminous Mixtures." Annual Book of ASTM Standards, Volume 04.03, ASTM, West Conshohocken, Pennsylvania, 1996. American Society for Testing and Materials. Standard Specification D2950-96, "Density of Bituminous Concrete in Place by Nuclear Methods. "Annual Book of ASTM Standards, Volume 04.03, ASTM, West Conshohocken, Pennsylvania, 1996. Waste rock, mill tailings, and coarse coal refuse can be used as a granular base in pavement construction applications. Burnt coal refuse (or red dog) from banks or piles that have caught on fire has also been used as a granular base material. Waste rock derived from igneous or metamorphic rocks, as well as properly consolidated limestones, sandstones, and dolomites are generally suitable for granular base and subbase applications, provided the waste rocks do not contain deleterious components and are not commingled with overburden. Coarser-sized mill tailings can be used in granular base and subbase applications. Generally, the coarser, sand-size fractions of mill tailings can also be considered for use as construction aggregates, provided there are no harmful or reactive chemical components concentrated from the host rock. Despite the fine size of most mill tailings, these materials can be blended with coarser materials, such as gravel, to bring the overall fines content to an acceptable range, or can often be classified prior to initial disposal in order to recover the coarser fraction for possible use. Coarse coal refuse can be used as aggregate in granular base applications. Burnt coal refuse (red dog) is also a suitable granular base material. Proper compaction of coarse coal refuse to its maximum dry density is necessary to achieve stability within a pavement structure. Fine coal refuse slurry has little or no load carrying capability and is, therefore, unsuitable for use as a construction material. The carbonaceous content of coal refuse, its potential for spontaneous combustion, as well as its pyritic or sulfur composition and acidic nature are causes for environmental concern. The use of mineral processing waste as a granular base material is not very common, since many mineral processing wastes are not close to urban areas where construction materials are needed. There is little current research or actual reported use of such wastes in granular base construction. The Pennsylvania Department of Transportation has rejected anthracite refuse usage as aggregate for base and subbase courses because of high percent losses in the sodium sulfate (soundness test). (4,5) West Virginia is evaluating the use of coal refuse as subbase material. Crushing and Screening: Where the waste rock consists of hard, stable chunks of rock with no overburden or vegetation, granular aggregate material can be produced by crushing. Crushing and screening can be accomplished using conventional aggregate processing equipment. Dewatering: Processing of certain tailings sources (such as dewatering, reclaiming, and selective size classification) may be necessary, although this is not common practice and can be costly. Tailings reclaimed from ponds will normally require a reasonable period of time to dewater, depending on climatic conditions. Screening: Some tailings materials may contain sufficient coarse sizes (greater than 2.0 mm (No. 10 sieve) or 4.75 mm (No.4 sieve)) that could be classified and separated from the finer fraction for possible use as a granular base material. Separation or Cleaning: The basic coal refuse processing techniques used in coal preparation plants are separation of the coal from the unwanted foreign matter (pyrite and marcasite). The equipment most frequently used in these plants to classify the refuse is based on the difference in specific gravity between the coal and the host rock. 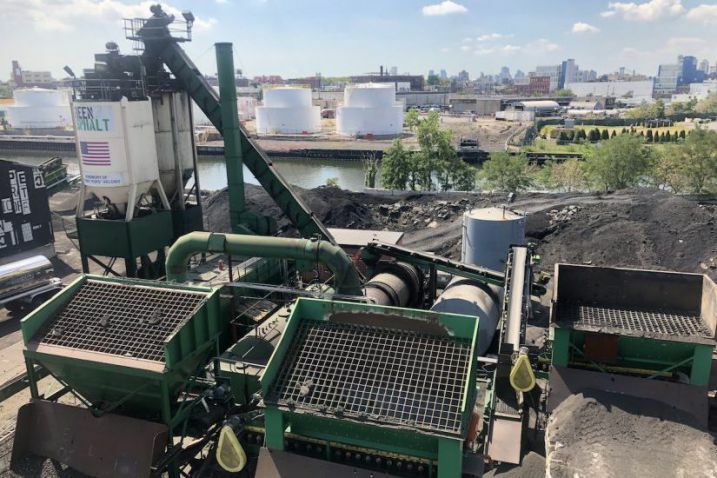 For older refuse banks, additional separation or cleaning may be required in the field to remove and recover the combustible portion of coarse coal refuse for use as fuel, prior to using the remaining refuse material as a granular base or subbase material. Such cleaning also serves to prevent potential spontaneous combustion of the refuse. Some of the properties of waste rock that are of particular interest when waste rock is used in granular base applications include gradation, specific gravity, and shear strength. Gradation: Waste rock is generally coarse, crushed, or blocky material covering a range of sizes, from very large boulders and rocks to sand-size particles and dust. Waste rock can be crushed and screened for use or blended with other aggregates to generate a product suitable for granular base or subbase aggregate. Shear Strength: Typical values of the angle of internal friction of most waste rock sources exceed 35 degrees and contribute to relatively high bearing capacity and stability. Some of the properties of mill tailings that are of particular interest when mill tailings are used in granular base applications include gradation, particle shape and texture, unit weight, and moisture-density characteristics. It is difficult to definitively characterize representative samples of mill tailings materials because of the number of sources and the variations in the degree of processing that can be encountered. Gradation: Typically, mill tailings range from sand to silt-clay in particle size with 40 to 90 percent passing a 0.075 mm (No. 200) sieve. They are normally disposed of in slurry form by pumping into large retention areas/settlement ponds. (8) Despite the fine size of most mill tailings, these materials can be classified prior to disposal or blended with coarser materials, such as gravel, to bring the overall fines content to an acceptable range for use as a construction aggregate. Shape and Texture: Mill tailings consist of hard, angular, siliceous particles. Some of the properties of coal refuse that are of particular interest when coal refuse is used in granular base applications include gradation, particle shape/ texture, moisture-density characteristics, shear strength, permeability, and frost susceptibility. Gradation: Coarse refuse, which can contain particles that are greater than a 4.75 mm (No. 4) sieve, is generally a well-graded material for particles up to 100 mm (4 in) in size. These particles consist mainly of slate or shale with some sandstone or clay. Most coarse refuse contains particles that may break down under compaction equipment, resulting in a finer gradation following placement. Shape/Texture: Coal refuse is composed mainly of flat slate or shale particles with some coal, sandstone, and clay intermixed. Such particles may weather or break down easily. There are no standard specifications for the use of crushed waste rock in granular base applications. Most sources of waste rock are of a quality that is comparable to conventional aggregates used as granular base materials, so specifications applicable to such aggregates can probably be used, provided sufficient compaction is achieved. There are no standard specifications for mill tailings as an aggregate in granular base. The tailings must meet sizing requirements and satisfy standard Proctor moisture-density criteria. (17) Durability testing may also be required. Most tailings sources may have an excess amount of material finer than the 4.75 mm (No. 4) or 2.00 mm (No. 10) sieve. This will either limit their use in granular base course applications or necessitate separation and use of the coarser fraction of the tailings. Waste Rock and Mill Tailings: The same methods and equipment used to store or stockpile conventional aggregates are applicable for waste rock or mill tailings. Coal Refuse: Prior to using the refuse to construct a granular base, the bank should be cleaned or processed to recover the residual coal or combustible matter. This ordinarily involves a screening of the refuse, which also removes oversize and deleterious materials. Waste Rock: The same methods and equipment used to place and compact conventional aggregate can be used for the placement of waste rock. As with any other oversize rock placement, compaction operations must be inspected on a continuous basis to ensure that the specified degree of compaction can be achieved, or that there is no movement under the action of compaction equipment. Mill Tailings: No modifications to normal construction equipment or procedures are needed, except that tailings may need to be dried to near optimum moisture content prior to placement and compaction. Coal Refuse: Strict compaction control testing must also be performed when using coal refuse as a base. A determination of the sulfate levels leached from the coarse refuse materials is required in order to design for the protection of any adjacent concrete structures. The pH value of the refuse in water should also be determined for proper selection of type of underdrain or other drain pipes. There is also a need to determine whether specific sources of such materials are environmentally suitable for use in granular base construction. In addition, there is a need to develop engineering data on the design properties and performance of potential waste rock and/or mill tailings used in granular base applications. There is a need to further evaluate the environmental concerns regarding the potential for acidic leachate from coarse coal refuse used in granular base applications. The production of such leachate is caused by the oxidation of pyrite and marcasite with the presence of high sulfur content. If acidic leachate were to be produced over time, it could contaminate groundwater, adversely impact the ecosystem, and cause deterioration or corrosion of underdrains or other drain pipes. More information may be needed to completely mitigate concerns associated with the spontaneous combustion potential of coarse coal refuse. Collins, R. J., and Miller, R. H. Availability of Mining Wastes and their Potential for Use as Highway Material. Federal Highway Administration, Report No. FHWA-RD-76-106, Washington, DC, May, 1976. Wilmoth, R. C., and R. B. Scott. "Use of Coal Mine Refuse and Fly Ash as a Road Base Material," Proceedings of the First Symposium on Mine and Preparation Plant Refuse Disposal. Louisville, Kentucky, October, 1974. Luckie, P. T., J. W. Peters, and T.S. Spicer. The Evaluation of Anthracite Refuse as a Highway Construction Material. Pennsylvania State University, Special Research Report No. SR-57, July, 1966. Collins, R. J., and R. H. Miller. Availability of Mining Wastes and Their Potential for Use as Highway Material: Executive Summary. Federal Highway Administration, Final Report No. FHWA-RD-78-28, Washington, DC, September 1977. Maneval, D. R. "Utilization of Coal Refuse for Highway Base or Subbase Material," Proceedings of the Fourth Mineral Waste Utilization Symposium. IIT Research Institute, Chicago, Illinois, May, 1974. Wright Engineers Limited, Golder, Brawner and Associates Limited, and Ripley, Klohn and Leonoff International Limited. Tentative Design Guide for Mine Waste Embankments In Canada. Technical Bulletin TB 145, Mines Branch Mining Research Centre, Department of Energy, Mines and Resources, Ottawa, Canada, March, 1972. Emery, J. J. "Use of Mining and Metallurgical Waste in Construction," Minerals and Environment, Paper No. 18, London, June, 1974. Sultan, H.A. Utilization of Copper Mill Tailings for Highway Construction. Final Technical Report, National Science Foundation, Washington, DC, January, 1978. McQuade, P. V., P. E. Glogowski, F. P. Tolcser, and R. B. Anderson. Investigation of the Use Of Coal Refuse-Fly Ash Compositions as Highway Base Course Material: State of the Art and Optimum Use Area Determinations. Federal Highway Administration, Interim Report No. FHWA-RD-78-208, Washington, DC, September, 1980. Bishop, C. S. and N. R. Simon. "Selected Soil Mechanics Properties of Kentucky Coal Preparation Plant Refuse," Proceedings of the Second Kentucky Coal Refuse Disposal and Utilization Seminar. Lexington, Kentucky, May, 1976. Tanfield, R. K., "Construction Uses of Colliery Spoil," Contract Journal, January, 1974. Zook, R. L., B. J. Olup, Jr., and J. J. Pierre. "Engineering Evaluation of Coal Refuse Slurry Impoundments," Transactions of the Society of Mining Engineers. AIME, Volume 258, March, 1975. Drenevich, V. P., R. J. Ebelhar, and G. P. Williams. "Geotechnical Properties of Some Eastern Kentucky Surface Mine Spoils," Proceedings of the Seventh Ohio River Valley Soils Seminar, Lexington, Kentucky, October, 1975. Moulton, L. K., D. A. Anderson, R. K. Seals, and S. M. Hussain. "Coal Mine Refuse: An Engineering Material," Proceedings of the First Symposium on Mine and Preparation Plant Refuse Disposal. Louisville, Kentucky, October, 1974. Kettle, R. J., and R. I. T. Williams. "Frost Action in Stabilised Colliery Shale," Presented at the 56th Annual Meeting of the Transportation Research Board, Washington, DC, January, 1977. American Association of State Highway and Transportation Officials. Standard Method of Test, "The Moisture-Density Relations of Soils Using a 5.5-lb [2.5 kg] Rammer and a 12-in. [305 mm] Drop," AASHTO Designation: T99-86, Part II Tests, 16th Edition, 1993. American Association of State Highway and Transportation Officials. Standard Method of Test, "Strength Parameter of Soils by Triaxial Compression," AASHTO Designation: T 234-85, Part II Tests, 16th Edition, 1993. American Association of State Highway and Transportation Officials, Standard Method of Test, "Direct Shear Test of Soils Under Consolidation Drained Conditions," AASHTO Designation: T236-84, Part II Tests, 16th Edition, 1993. American Association of State Highway and Transportation Officials. Standard Method of Test, "The California Bearing Ratio," AASHTO Designation: T193-81, Part II Tests, 16th Edition, 1993. British Standard Institution. "Methods of Testing Soils for Civil Engineering Purposes, B.S. 1377, Test 9. Determination of the total sulphate content of soil, and Test 10, Determination of the sulphate content of groundwater and of aqueous soil extracts." London, 1967. Pierre, J. J., and C. M. Thompson. User's Manual Coal-Mine Refuse in Embankments. Federal Highway Administration, Report No. FHWA-TS-80-213, Washington, DC, December, 1979. American Association of State Highway and Transportation Officials. Standard Method of Test, "Direct Shear Test of Soils Under Consolidation Drained Conditions," AASHTO Designation: T236-84, Part II Tests, 16th Edition, 1993. American Association of State Highway and Transportation Officials. Standard Method of Test, "Density of Soil In-Place by the Sand Cone Method," AASHTO Designation: T191-86, Part II Tests, 14th Edition, 1986. American Association of State Highway and Transportation Officials. Standard Method of Test, "Density of Soil In-Place by the Rubber-Balloon Method," AASHTO Designation: T205-86, Part II Tests, 14th Edition, 1986. American Association of State Highway and Transportation Officials. Standard Method of Test, "Density of Soil and Soil-Aggregate in Place by Nuclear Methods (Shallow Depth)," AASHTO Designation: T238-86, Part II Tests, 14th Edition, 1986. American Association of State Highway and Transportation Officials. Standard Method of Test, "Moisture Content of Soil and Soil Aggregate in Place by Nuclear Methods (Shallow Depth)," AASHTO Designation: T239-86, Part II Tests, 14th Edition, 1986. Lin, I. J., "Seasonal Effects on Processing Plants." International Mining, January, 1989. Several different types of mineral processing wastes, particularly mill tailings and coarse coal refuse, have been successfully used to construct highway embankments. To a lesser extent, waste rock has also been sporadically used as a fill material in highway construction. Waste rock derived from igneous or metamorphic rocks, as well as properly consolidated limestones, sandstones and dolomites, are generally suitable for use in embankment or fill construction applications, provided the rocks do not contain deleterious components and are not commingled with overburden. Prior to use, some consideration should be given to the leaching potential of waste rock from sulfide-based ore bodies (such as lead, zinc, or silver) or waste rock subjected to heap leaching. Mill tailings have been used previously in embankment and fill applications by some state and local highway agencies. Generally, the coarser, sand-size fractions of mill tailings can also be used as a construction aggregate, provided there are no harmful or reactive chemical components concentrated from the host rock. Despite the fine size of most mill tailings, these materials can be blended with coarser materials, such as gravel, to bring the overall fines content to an acceptable range, or can often be classified prior to initial disposal in order to recover the coarser fraction for possible use. However, the metal leaching potential of these materials can be a cause for environmental concern and should be thoroughly investigated prior to embankment use. Coarse coal refuse can be used in embankment applications. Proper compaction of coarse coal refuse to its maximum dry density is necessary to achieve stability and to minimize the potential for spontaneous combustion. Burnt coal refuse (red dog) is also a suitable embankment or fill material. Fine coal refuse slurry has little or no load carrying capability and is, therefore, unsuitable for use as a construction material. Potential problems with spontaneous combustion associated with the carbonaceous content of coal refuse, its pyritic or sulfur composition, and acidic nature are causes for environmental concern. Mineral processing wastes have been used in a number of states during the past 30 to 40 years for embankment applications where such materials have been available, acceptable, and economical. The coarser, sand-size fractions of most mill tailings ordinarily make acceptable embankment construction materials, provided there are no harmful or reactive chemical components contained in the tailings. Despite the fine size of most of tailing materials, they can be readily classified or blended with coarser materials, such as natural gravel, to bring the overall fines content to a more acceptable range. Table 6. List of mining waste embankment or structural backfill projects constructed in the United States. Crushing: Crushing and sizing is the only processing required to make use of oversize waste rock in embankments. Waste rock should be free of overburden and vegetation before crushing..
Dewatering: For certain mill tailings sources, some processing (such as dewatering, reclaiming, and selective size classification) may be necessary, although this is not common practice and can be costly. Tailings reclaimed from ponds will normally require a reasonable period of time to dewater, depending on climatic conditions. Screening: Some fine tailings can be size classified to recover a coarser fraction (between the 4.75 mm (No. 4) and 0.075 mm (No. 200) sieves) for use as an embankment construction material. Separation or Cleaning: Various mineral processing techniques are used to separate the coal from the unwanted foreign matter in coal preparation plants. The equipment most frequently used in these plants to classify the refuse is based on the difference in specific gravity between the coal and the host rock. Additional separation or cleaning may be required in the field in order to remove and recover the combustible portion of coarse coal refuse for use as fuel, prior to placing the remaining refuse material in an embankment. This is particularly the case for older refuse banks. Some of the properties of waste rock that are of particular interest when waste rock is used in embankment or fill applications include gradation, specific gravity, and shear strength. Gradation: Waste rock is generally coarse, crushed, or blocky material covering a range of sizes, from very large boulders to fine sand-size particles and dust. Waste rock can be processed and blended with other aggregates to generate a product suitable for use in embankment construction. Some of the properties of mill tailings that are of particular interest when mill tailings are used in embankment or fill applications include gradation, particle shape and texture, moisture-density characteristics, and unit weight. The chemical composition of the tailings should also be known prior to its use. It is difficult to definitively characterize representative samples of mill tailings materials because of the number of sources and variations in the degree of processing that can be encountered. Gradation: Typically, mill tailings range from sand to silt-clay in particle size, with 40 to 90 percent passing a 0.075 mm (No. 200) sieve. They are usually disposed of in slurry form by pumping into large retention areas or settlement ponds. (7) The coarser, sand-size fractions, if any, of mill tailings are more highly recommended for embankment construction. Mill tailings can be classified prior to disposal or blended with coarser materials, such as gravel, to bring the overall fines content to an acceptable range, preferably less than 35 percent passing a .0075 mm (No. 200) sieve. Shape/Texture: Mill tailings consist of hard, angular, siliceous particles. Some of the properties of coarse coal refuse that are of particular interest when coarse coal refuse is used in embankment or fill applications include gradation, particle shape/ texture, moisture-density characteristics, strength, permeability, durability, resistance to wetting/drying, and frost susceptibility. Gradation: Coarse coal refuse, which is greater than 4.75 mm (No. 4 sieve), is a well-graded material (can vary in size from 100 mm (4 in) to 2 mm (No. 10 sieve)) consisting mainly of slate or shale with some sandstone or clay. Most coarse refuse contains particles that may break down under compaction equipment, resulting in a finer gradation following placement. Resistance to Wetting/Drying: Coal refuse begins weathering immediately after it has been placed in an embankment. Increases in the soluble sulfur content can induce oxidation of the pyrite. However, once the material is sealed within the embankment, oxidation is limited and weathering is greatly reduced. Water penetration is virtually eliminated, along with the degradation resulting from intermittent wetting and drying. Structural design procedures to be employed for embankment or fill construction containing waste rock or mill tailings are essentially the same as design procedures that are used for conventional embankment materials. An analysis of the slope stability and consolidation characteristics of the embankment must be completed prior to construction. Some tailings sources may have an excessive amount of fines (greater than 35 percent passing the 0.075 mm (No. 200) sieve) which could necessitate prior classification or separation and use of only the coarse fraction of the tailings in an embankment or fill. Design procedures for embankments or fill containing coal refuse are the same as design procedures for conventional embankment materials. Slope stability and settlement analyses should be conducted to ensure that the coal refuse embankment is stable at the design slope and will not settle excessively. The potential for weathering and frost heave must also be considered. Waste Rock and Mill Tailings: The same methods and equipment used to store or stockpile conventional aggregates are applicable for waste rock and mill tailings. Coal Refuse: Prior to using the refuse to construct embankments or fills, the bank should be cleaned or processed to recover the residual coal or combustible matter. This ordinarily involves a screening of the refuse, which also removes oversize and deleterious materials. Waste Rock: The same methods and equipment used to place and compact conventional rock as embankment base or foundation material can be used for the placement of mine waste rock. Compaction operations and methods must be visually inspected on a continuous basis to ensure that the specified degree of compaction can be achieved, or that there is no movement under the action of compaction equipment. The construction of embankment bases or foundations containing rock or oversize materials usually requires a method specification, which describes how to place and compact such materials, but does not include test methods or acceptance criteria. Mill Tailings: No modifications to normal construction equipment or procedures are needed for placing and compaction of mill tailings, except that mill tailings may need to be dried to near optimum moisture content prior to placement and compaction. Coal Refuse: Strict compaction control testing is necessary when building an embankment with coarse coal refuse. One of the best methods for controlling the compaction of coarse coal refuse embankments is to first place a test strip to determine the most appropriate compaction equipment and number of passes to ensure adequate compaction. The test strip will also assist in identifying the degree of particle breakdown and its effect on moisture-density characteristics for different types of compaction machinery. The quality control test procedures described above for waste rock and mill tailings are also applicable to coarse coal refuse, except that some refuse particles may be too large for certain in-place density tests. Special Considerations: A determination of the sulfate levels that may be leached from coarse coal refuse is required in order to design for the protection of any adjacent concrete structures. The pH value of the refuse in water should also be determined for proper selection of type of underdrain or other drain pipes. Waste Rock and Mill Tailings: General specifications and design methods should be developed for waste rock and/or mill tailings use in embankment or fill applications by those agencies where such materials are logistically available in large quantities and are suitable for embankment or fill use. There is also a need to determine whether specific sources of such materials are environmentally suitable for embankment construction, particularly some sources of mill tailings. Engineering data are needed on the design properties and performance of waste rock and/or mill tailings that have been successfully used in highway embankment or fill applications. Coal Refuse: There is a need to further evaluate environmental concerns regarding the potential for acidic leachate from coarse coal refuse used in embankments. The production of such leachate is caused by the oxidation of pyrite and marcasite with presence of high sulfur content. If acidic leachate were to be produced over time, it would contaminate ground water, adversely impact the ecosystem, and cause deterioration or corrosion of underdrains or other drain pipes. Collins, R. J. and R.H. Miller. Availability of Mining Wastes and their Potential for Use as Highway Material. Federal Highway Administration, Report No. FHWA-RD-76-106, Washington, DC, May, 1976. Butler, P. "Utilization of Coal Mine Refuse in Highway Embankment Construction," Transactions of the Society of Mining Engineers. AIME, Volume 260, June, 1976. Pierre, J. J. and C. M. Thompson. User’s Manual - Coal Mine Refuse in Embankments. Federal Highway Administration, Report FHWA-TS-80-213, Washington, DC, December, 1979. Maneval, D. R. "Utilization of Coal Refuse for Highway Base or Subbase Material," Proceedings of Fourth Mineral Waste Utilization Symposium. IIT Research Institute, Chicago, Illinois, May, 1974. Emery, J. J. "Use of Mining and Metallurgical Waste in Construction," Minerals and Environment. Paper No. 18, London, June, 1974. Sultan, H. A. Utilization of Copper Mill Tailings for Highway Construction. Final Technical Report, National Science Foundation, Washington, DC, January, 1978. McQuade, P. V., P. E. Glogowski, F. P. Tolcser, and R.B. Anderson. Investigation of the Use Of Coal Refuse-Fly Ash Compositions as Highway Base Course Material: State of the Art and Optimum Use Area Determinations. Federal Highway Administration, Interim Report No. FHWA-RD-78-208, Washington, DC, September,1980. Bishop, C. S. and N. R. Simon. "Selected Soil Mechanics Properties of Kentucky Coal Preparation Plant Refuse," Proceedings of the Second Kentucky Coal Refuse Disposal and Utilization Seminar. Lexington, Kentucky , May, 1976. Tanfield, R. K. "Construction Uses of Colliery Spoil," Contract Journal. Great Britain, January, 1974. Drenevich, V. P., R. J. Ebelhar, and G. P. Williams. "Geotechnical Properties of Some Eastern Kentucky Surface Mine Spoils," Proceedings of the Seventh Ohio River Valley Soils Seminar. Lexington, Kentucky, October, 1975. Stewart B. M., and Atkins, L. A. Engineering Properties of Combined Coarse and Fine Coal Wastes. Bureau of Mines Report of Investigations; 8623, United States Department of the Interior, 1982. American Association of State Highway and Transportation Officials. Standard Method of Test, "The Moisture-Density Relations of Soils Using a 5.5-lb [2.5 kg] Rammer and a 12-in. [305 mm] Drop," AASHTO T99-86, Part II Tests, 16th Edition, 1993. British Standard Institution. "Methods of Testing Soils for Civil Engineering Purposes, B.S. 1377, Test 9, Determination of the total sulphate content of soil, and Test 10, Determination of the sulphate content of ground water and of aqueous soil extracts," London, 1967. American Association of State Highway and Transportation Officials. Standard Method of Test, "Strength Parameter of Soils by Triaxial Compression," AASHTO Designation: T234-85, Part II Tests, 16th Edition, 1993. American Association of State Highway and Transportation Officials. Standard Method of Test, "Direct Shear Test of Soils Under Consolidation Drained Conditions" AASHTO Designation: T236-84, Part II Tests, 16th Edition, 1993. American Association of State Highway and Transportation Officials. Standard Method of Test, "One-Dimensional Consolidation Properties of Soils," AASHTO Designation: T216-83, Part II Tests, 16th Edition, 1993. American Association of State Highway and Transportation Officials. Standard Method of Test, " Density of Soil In-Place by the Sand Cone Method," AASHTO Designation: T191-86, Part II Tests, 14th Edition, 1986.